It’s 5 pm. There’s a mess on the floor, the baby’s crying, and your two-year-old has just discovered the word ‘no’. You’re nowhere near your work target and dinner is still a distant notion. You think longingly about being a full-time parent. Or a full-time professional who can afford a nanny. Because surely it’s easier to be one thing, rather than constantly splitting yourself in two? Many women – and men, for that matter – decide to leave the workforce and start writing when they have a baby. Picture the scene. A rosy-faced infant sleeps peacefully in a cot near your desk. You stop writing long enough to smile at your child and sip your cappuccino, before putting the final touches to your latest best seller. Life couldn’t be better. Now, the reality. Bleary-eyed from lack of sleep, you stare frowning at the computer. A child sits on your lap, pulling your hair and babbling into your face. You’ve written a grand total of ten words, and haven’t even thought about the housework. It sounds hard – and it is. But there’s nothing I’d rather do; I have time with my kids and can still do the work I love. Okay, maybe the writing progresses slower than it would otherwise, and maybe the house isn’t immaculate. But does it matter? For those of you starting on a similar journey, here are my survival tips for writing while raising children. Trying to write while your kids want attention is a recipe for disaster. You end up getting frustrated and cross, and they haven’t really done anything wrong. They just want you. If you persist your kids suffer, your work suffers, and so do you. 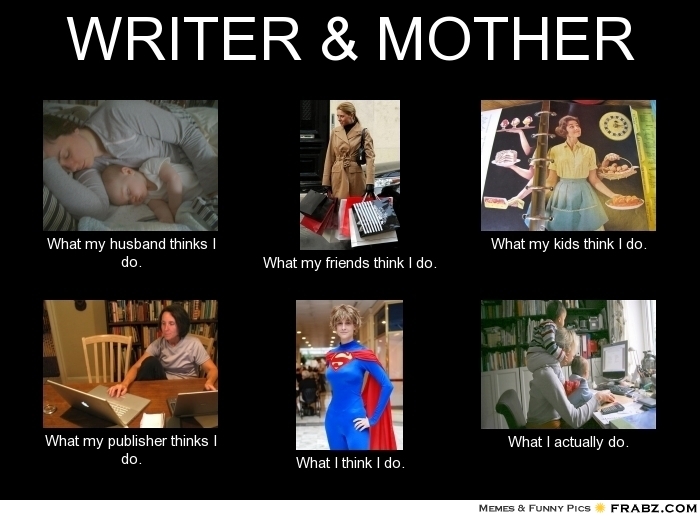 I know it’s hard, but try to split your day between writing and parenting. Work when they sleep or when they are otherwise safely occupied. Enjoy your kids now – the years will fly before you know it, and soon they’ll be pushing you out of their way! You probably figured this one out already. Until my youngest started school, I’d get up at 4 am and try to do a few hours before the kids woke up. When they napped, I wrote rather than rested. It worked, but it’s permanently screwed up my body clock. (6 am is now a leisurely lie-in for me.) You might work better at night. Find what works for you, make the commitment, and just do it. Not such an issue if you’re just starting to write, but if you’re already a professional, be careful not to overcommit with writing projects. Meetings deadlines is important. Beware of taking on more than you are capable of, or you risk looking bad to your publishers. 5. Finally, something that’s all about you! Wow, ten words! That’s a great effort! Seriously though, some very good advice here. I have found that the time when both kids are asleep in the day is the most productive for me (I have managed to manipulate their routines so both sleep between 10am and midday, and their sleeps usually overlap by at least an hour and a half). Housework can be done while they are both awake (sort of – at least it can if your standards are as low as mine) but for writing I really need that quiet time. With regard to your points, the first one really rings true for me. At first, I was trying to write while they were active, and I found I just ended up getting frustrated and taking it out on them, which was unfair. By making sure I focus on them when they need me, and leave the writing until they are both asleep, I am more relaxed and enjoying the time with them more, and my writing is also better for it. Thanks Huw, good point re doing the housework while they’re awake. I’m glad you saw this post, by the way, because I thought of you while I was writing it : ) Glad to hear you’re still writing! Hearing you loud and clear Stella! My backup belief: I can always write when I’m 50. But I won’t hear that exact giggle from my 7 yo in quite the same way tomorrow. Enjoy and live for the moment, whilst furtively recording them all to memory so you can write about them later! Nice post. Exactly right! Thanks for the comment! Thank you. It’s a very special time in our lives, but all too short. As you say, we can relive it a bit with pets – that’s my plan! I used to have a beautiful golden retriever, and he was very much part of the family. Melinda, I take my hat off to you. Working full-time but still managing to do it all! I see you’re an attorney; I’m an ex-lawyer myself. That’s very full on. I understand why you need a creative outlet! ← That awesome acceptance letter!